Musa acuminata ssp. zebrina is a subspecies of Musa acuminata, the wild species involved in the domestication of the vast majority of cultivated bananas. It is one of the four main subspecies of Musa acuminata that have contributed to the genetics of edible bananas. However, this taxon has never been published as a subspecies of Musa acuminata, nor has it been classified as a variety within any of the published subspecies. In 1991, it was classified as a botanical variety of Musa acuminata by Rusdy E. Nasution. The World Checklist of Selected Plant Families maintained by Kew considers Musa acuminata var. zebrina as a synonym of Musa acuminata ssp. acuminata. The plant was first described in 1854 as Musa zebrina from Java, Indonesia. It was named for the zebra-like striping of red pigmentation on the upper sides of young leaves. It was classified as a botanical variety of Musa acuminata by Rusdy E. Nasution in 1991. Other published taxa by the same author—M. acuminata var. nakaii and var. sumatrana—bear foliar similarities in the characteristic coloring of at least young plants, but the genetic relationship between these taxa has not been studied. In non-technical literature, this taxon is referred to as being synonymous with var. sumatrana, but there is no technical basis for this, and Nasution maintained that all three of these varieties are distinct. The authors of a checklist of Musa names, Markku Hakkinen and Henry Vare, recommended to uphold the variety status, presumably until further study may reveal a better classification fit. Prior to his passing in 2015, Markku Hakkinen had planned to create a Musa acuminata subsp. zebrina, with var. zebrina, var. cerifera, var. nakaii, and var. rutilipes reclassified underneath it. This reorganization proposal has not yet been validly published, but may provide the basis for future work (Gabriel Sachter-Smith, pers. comm.). Indonesia: Java, on open places, 250-900m above sea level. Grown in Sumatera as an ornamental, but never found as wild plant. The description is from Rudy E. Nasution's taxonomic study. Medium clump up to 13 stems: pseudostems slender, medium, 2.0-2.7m length, 6-9cm diameter, brown blotching without wax. Leaf blades lanceolate, 1.3-1.5m long, 26-34cm wide, apex truncate, base cuneate with unequal lobes, green upperside sometimes with bars of purplish brown pigmentation, purplish underside and glaucous. Petioles short, 35-40cm long, purple with black markings at base; their margins nearly revolute leaving an open adaxial channel; mid-rib light purple. Inflorescence horizontal then pendulous, up to 1.1m long; its peduncle thinly pubescent. First bract scar openly or closely encircling. Fruits and flowers biseriate: 5-8 hands per bunch, 14-16 fruits per hand. Basal hands each bear fewer fruits (7-9) than those on the apex (14-16). Fruits small. 5.0-6.6cm long, 1.5-1.9 cm across, pedicels 0.5-0.6cm long, tips 1.1-1.2cm. Pericarp thin, pulp yellowish, slightly soft when ripe. Seeds many, 60-80 per fruit, irregularly angular, depressed, smooth, 5.8-6.3 mm diameter, black when ripe. Male bud broad ovoid, 5.5-7.8cm long, 3.5-4.5cm across, coracoid, blunt tip, dark purple outside, bright purple inside, glaucous. Basal flowers female, relatively big; ovary 3.0-3.2cm long, 0.6-0.7cm diameter, yellowish green, purple outside: style 2.2-2.3cm long, sub-terete, cream: stigma capitate, slightly flat, 0.5-0.6cm diameter, bright yellow to cream. Staminode 1.1-1.2cm long, 1.3-1.4cm wide, light yellow at base but bright yellow at tips. Free tepal ovate. 1.5-1.6cm long, 1.1-1.2cm wide, tip tridentate, translucent. Male flowers small, 16-18 per hand; ovary 0.8-0.9cm long, 0.3-0.4cm across, yellow inside, purple outside; style 2.4-2.8cm long, white at base but yellow at tip; stigma capitate. Compound tepal 2.9-3.0cm long, 1.0-1.1cm wide, base white or light yellow with yellow tip. Free tepal oblong, 1.1-1.2cm long, 0.6-0.7cm wide, tip tridentate, translucent. Stamen 2.6-3.2cm long, 0.2-0.3cm wide, light yellow: anther 1.4-1.6cm long, pink filament nearly as long as anther. Pollen grains many and fertile. This name is attributed to Musa acuminata var. zebrina plants in Hawaii. At one point it was thought that perhaps this plant was brought on canoes with early Polynesian voyagers, but its absence in other Pacific Islands suggests it was a post-European contact introduction, presumably for ornamental purposes. 'Pisang monyet' (monkey banana) is used similarly to 'Pisang hutan' (forest banana) to refer to any wild banana. A parthenocarpic diploid clone with superficial similarities is widespread in the horticultural trade and in botanic gardens. It is often erroneously called Musa zebrina, Musa sumatrana, Musa acuminata subsp. zebrina, Musa acuminata subsp. sumatrana or ‘Blood Banana’. It is even present at the ITC as Zebrina (G.F.) (ITC0966), and possibly as Zebrina (ITC1139) (Gabriel Sachter-Smith, personal observations). Setting aside that all of these botanical names are either outdated or invalid, they refer to seeded, wild bananas, not parthenocarpic clones. There are a few clues as to the origins of this clone, but it’s frequent confusion with the true Musa acuminata var. zebrina and var. sumatrana make tracking information on it somewhat difficult. A disputed account of its origin is from Florida banana collector, Bill Lessard. 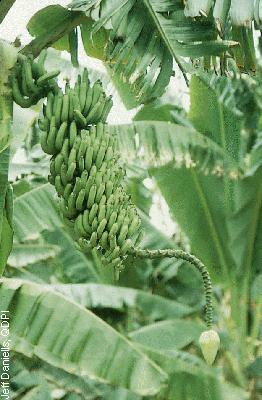 In his 1992 book “The Complete Book of Bananas”, Lessard claims to have made a cross pollination between his Musa sumatrana plant and the Cavendish cultivar ‘Grande Naine’ that resulted in a few seeds, one of which gave rise to a plant. The false zebrina does indeed seem to fit somewhere between those purported parents morphologically. Another possibility is that it is an ornamental selection of ‘SH-3008’ introduced by FHIA to the Agri-Starts commercial tissue culture laboratory in Florida in 2002. ‘SH-3008’ is described as having “beautiful large leaves with maroon under side and splotched maroon and green on the top side of the leaves. Resembles the Zebrina/Sumatrana except larger and fuller.” It has not been confirmed if ‘SH-3008’ and Lessard’s hybrid are the same plant. Their appearance in publication are separated by over a decade which gives merit to Lessard’s origin story for his hybrid, but more confusion as to which one may have given rise to the ubiquitous but erroneous “Zebrina” of the horticultural trade. Given this situation, it is not inconceivable that papers have been written about the wrong plant and that work may need to be done to set the record straight. 1. Perrier, X., Bakry, F., Carreel, F., et al. 2009. Combining biological approaches to shed light on the evolution of edible bananas. Ethnobotany Research and Applications 7:199-216. 2. Perrier, X., De Langhe, E., Donohue, et al. 2011. Multidisciplinary perspectives on banana (Musa spp.) domestication. PNAS 108(28):11311-11318. 3. Nasution, R.E. 1991. A taxonomic study of the species Musa acuminata Colla with its taxa in Indonesia. Memoirs of Tokyo University of Agriculture 32:1-122. 4. Musa acuminata var. zebrina in the World Checklist of Selected Plant Families maintained by Kew. Retrieved 5 February 2018. 5. Musa zebrina Van Houtte ex Planch, published in 1854 in Flore des Serres et des Jardins de l'Europe 10:223. 6. Häkkinen, M. and Väre, H. 2008. Typification and check-list of Musa L. names (Musaceae) with nomenclatural notes. Adansonia 30(1):63-112. 7. Kepler, A.K. and Rust, F.G. 2011. The world of bananas in Hawai'i: then and now. Pali-O-Waipi'o press, Hawaii. 586p. 10. Lessard, William O. 1992. The Complete Book of Bananas. Page last modified on Friday, 22 February 2019 17:41:06 CET by Anne Vézina.